Ayurvedic treatment for all liver problems. It is also very helpful in liver protective & corrective and has regenerating effects on the dead liver cells. An answer to all liver problems. It is very helpful in liver protective & corrective and havs regenerating effects on the dead liver cells. Natural herbal supplements for indigestion, herbal products for fatty liver, ayurvedic treatment for hepatitis, alcoholic liver disorders, loss of appetite, early cirrhosis of liver. It also improves the enlargement of liver and spleen naturally. 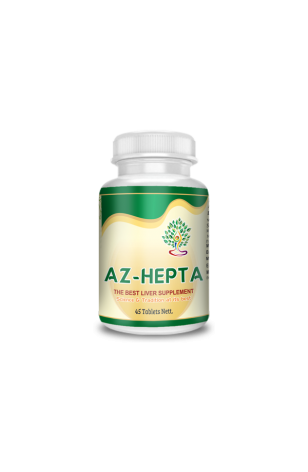 AZ-Hepta is a herbal formulation based on ancient science and modern research. The various herbs used in ayurveda are liver protective, corrective and have regenerating effects on the dead liver cells. These herbs stimulate liver regeneration, have bile purgative (pitta virechaka) effects, act as pitta-nashaka (destroyer) and pitta-shamka (reducer). They have been proved to have special action on viral hepatitis due to antiviral properties. Therefore, by keeping the pitta (fire) in its balanced state and due to their hepato-protective action, all these herbs are capable of dealing with all liver problems. Bhumi amla (Phyllanthus fraternus) - It cures inflammation of the liver. The extract of the plant is used to cure Hepatitis A, Hepatitis B and Hepatitis C. Specialists expect it to cure AIDS in the days to come. Kalmegh (Andrographis paniculata) - It also helps to support and strengthen the liver and it is used in combination with other herbs in several ayurvedic formulations to treat liver disorders. Sarpankha (Tephrosia purpurea) - Sharpunkha is recommended in conditions of enlarged spleen and disturbed liver functioning. Bhringraj (Eclipta alba) - Although jaundice often sounds like a disease from the long-distant past, many people in the world still suffer from this condition that severely affects the liver. Giloy (Tinospora cordifolia) - T. cordifolia is used in the indian ayurvedic system of medicine for the treatment of jaundice, diabetes, and rheumatoid arthritis, and is also used as an immunostimulant. Experiments have examined its antineoplastic, antioxidant, hepatoprotective, hypolipidemic, and immunologic properties; however, few clinical trials exist. Makoy (Soanum nigrum) - It protects liver and fight against jaundice. Pitt papda (Fumaria officinalis) - It has been shown to improve liver function by up to 80% plus detox and heal the liver in general and stimulating liver function. Nagarmotha (Cyperus scariosus) - Umbrella’s edge is an anti-inflammatory, central nervous system stimulant, antimicrobial and hypotensive product. Harar (Terminalia chebula) It helps in maintaining normal body temperature. Bahera (Terminalia bellirica) - It prevents ageing, imparts longevity, boosts immunity, improves mental faculties and enhances the body resistance against diseases. Amlaki (Emblica officinalis) - Treats many ailments such as common cold and fever as a diuretic, laxative, liver tonic, refrigerant, stomachic, restorative, alterative, antipyretic, anti-inflammatory, hair tonic, to prevent peptic ulcer and dyspepsia, and digestive product. Black pepper (Piper nigrum) - Black pepper is also used in case of heavy and powerful diets as it digests the meaty recipes easily. Long pepper (Piper longum) - It promotes digestive fire and cures vata and kapha disorders. Zingiber officinale (Rhizome) - This extremely useful herb is used to relieve patients suffering from dyspepsia, flatulence, vomiting, spasms, colic and other stomach problems. Chewing a piece of ginger regularly can help in relieving problems of excessive secretion of saliva, volatile oil and diastase enzyme.